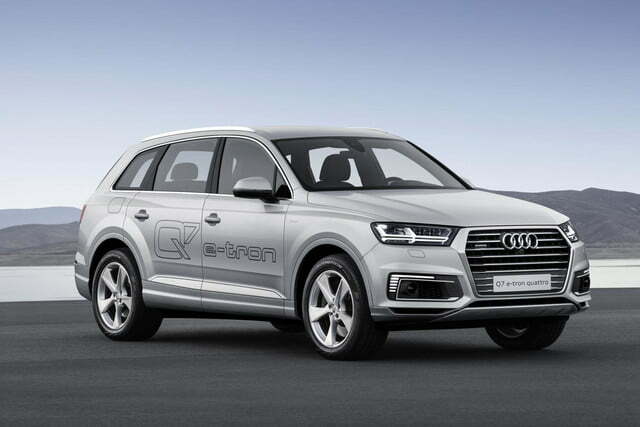 The 2016 Audi Q7 continues to morph into new permutations even before going on sale in the U.S.
At the 2015 Shanghai Auto Show, Audi will display the Q7 e-tron 2.0 TFSI, a different variant of the plug-in hybrid Q7 e-tron first shown back in December. While that version of the Q7 features a 3.0-liter TDI diesel V6, this one has a 2.0-liter turbocharged gasoline four-cylinder engine, hence the “2.0 TFSI” designation. That engine is teamed with an eight-speed automatic transmission, and an electric motor powered by a 17.3-kilowatt-hour lithium-ion battery pack. Together, the gasoline and electric components provide 367 horsepower and 516 pound-feet of torque, which is sent to all four wheels through Audi’s quattro all-wheel drive system. 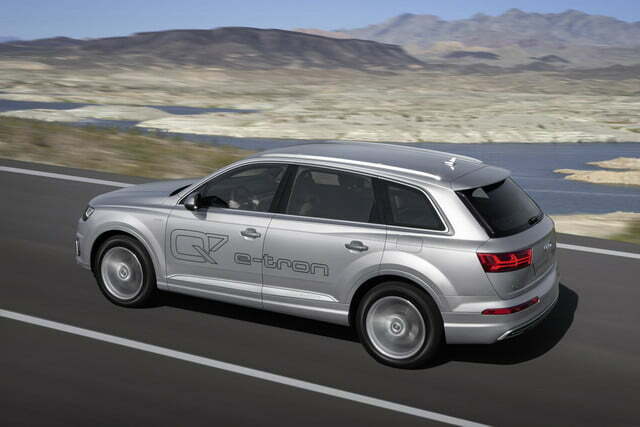 The gasoline four-cylinder Q7 e-tron has an identical torque figure to the diesel V6 version, which boasts 373 hp. 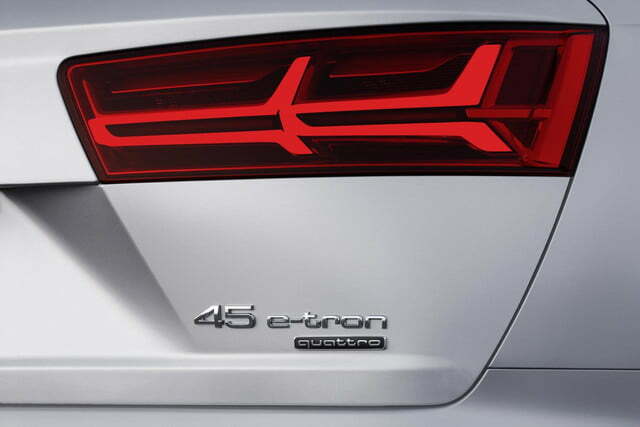 Interestingly, Audi says the four-cylinder version is also 0.1 second faster to 62 mph, at 5.9 seconds. Top speed is 136 mph, down 4 mph from the diesel. 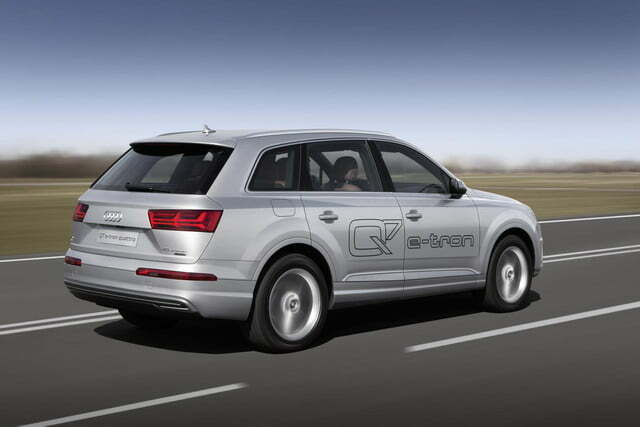 Audi says the Q7 e-tron 2.0 TFSI can drive on electric power only for up to 33 miles, and achieve 94.1 mpg when driving as a hybrid. 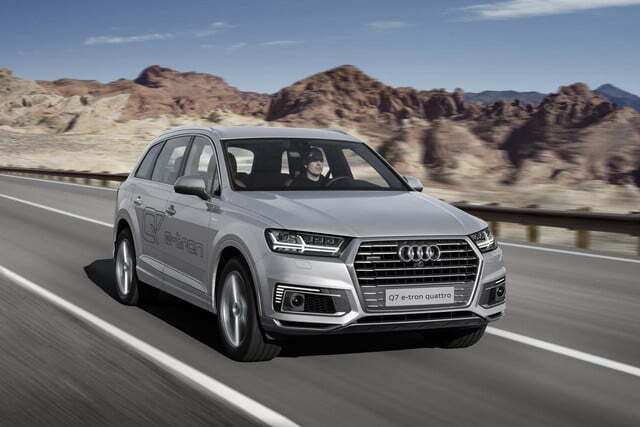 However, these figures are based on Chinese testing standards, which are different from the procedures used in the U.S.
Aside from the powertrain, this Q7 is identical to the rest of the redesigned 2016 lineup. That means it’s packed with tech, including a “virtual cockpit” display and the latest version of Audi’s MMI infotainment system, both with hybrid-specific features. 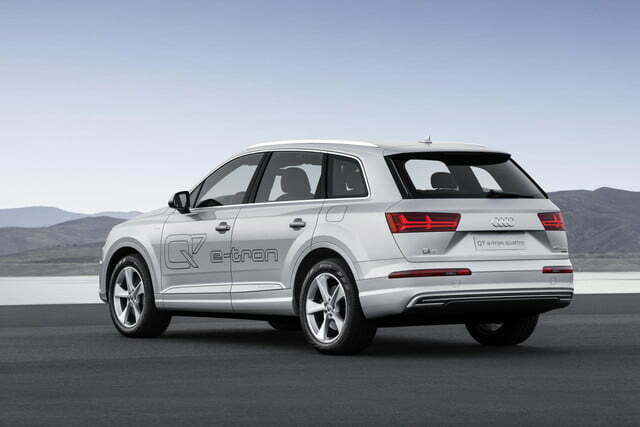 The infotainment features are based on Audi’s new modular platform, and includes an NVIDIA Tegra 30 graphics chip. Bose or Bang & Olufsen 3D sound systems are also available as options, as is the “phone box,” a wireless charger that also connects a phone to an external antenna for better reception. 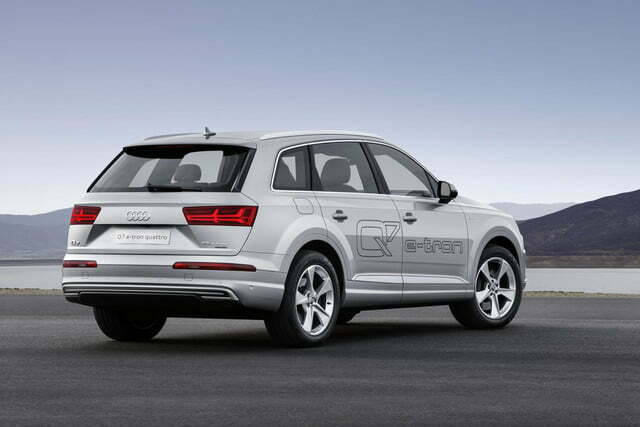 All of these features will be available on the 2016 Q7 when it launches in the U.S. later this year, but the four-cylinder plug-in hybrid powertrain won’t. 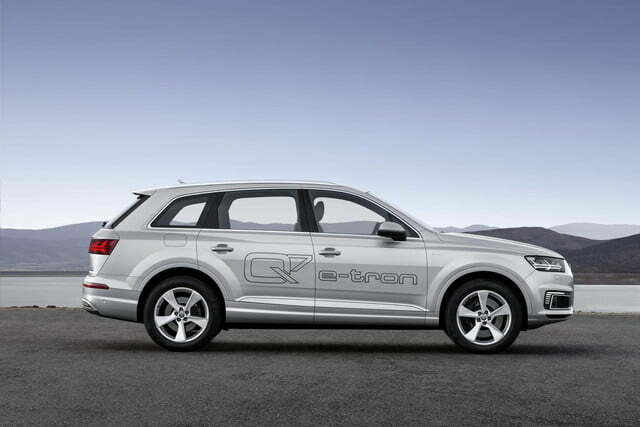 The Q7 e-tron 2.0 TFSI will only be sold in Asian markets, including China, Singapore, and Japan. 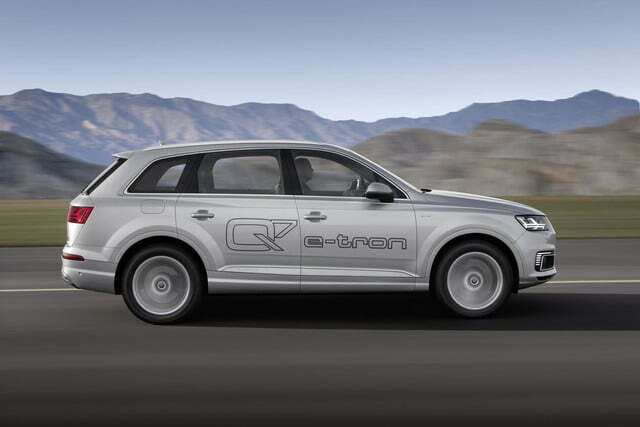 And Audi won’t sell the 3.0-liter diesel V6 version of the Q7 e-tron in the U.S. either. 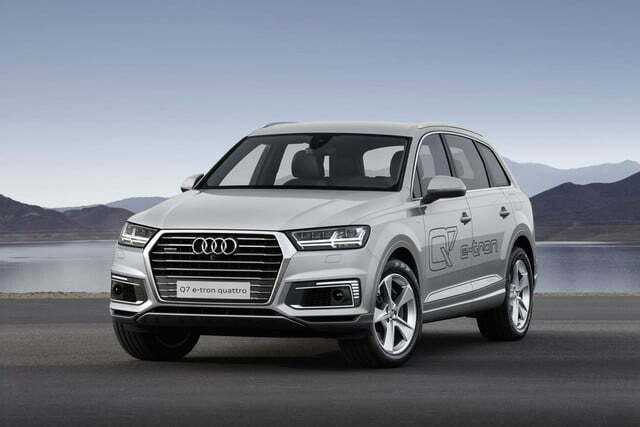 The company previously indicated that the diesel will be sold in Europe only, but that it will bring the plug-in hybrid Q7 to the U.S. in some form. Audi will presumably swap out the four cylinder for another gasoline engine, perhaps a larger one to better suit American buyers’ taste for displacement.